IBM has seen growth in demand for mainframe applications. “”We are not seeing much interest in Europe, but we are getting new customers in China and India for the z-series.” Douglas Nielson, a systems analyst at IBM, says Linux on the mainframe is quite mature. “Linux is a big driver for mainframe growth. 20% of new mainframe capacity is for Linux workloads.” He says many businesses already have the IFL processor to allow them to run Linux. The Public Key Cryptography Standard #11 module was developed to operate in the Fedora Core 5 environment and to implement Linux Logon, signing and encrypting email (following the S/MIME standard) and Web site authentication (following the SSL/TLS standard), configured in Linux OS, Thunderbird and Firefox applications. owadays, especially on the Internet, whenever you stumble upon a technical review, you ought to be cautious. Be very skeptical. It’s no secret that many companies hand out their products free of charge to particular people and expect flattering publicity in return. Renowned (or notorious rather) for this practice is Microsoft, but Apple is not better off. THE SULTANS OF SMUG at Apple have been showing just how much clout they have among tech journalists by asking their mates to run glowing reviews of the 3G Iphone. While we don’t begrudge Apple trying it on, we are quite frankly stunned at the ability of the American tech press to roll over when bribed by a gadget sent to them by someone that they want to be their chum. Apple is not an ethical company, but it’s apathetic towards GNU/Linux, as opposed to Microsoft that actively attacks it. So we leave Apple aside — for now. We have given some examples before where Microsoft gave gifts to people in exchange for stealth advertising. Such disguised marketing from Microsoft has even 'violated' professors. “These are just a few cases where the journalists end up snitching, so it’s a fact.”Microsoft happens to be doing this a lot, regardless of how prevalent this may be in general (well, that would be their excuse anyway). For example, more recently when the Inquirer had published a very negative review of Windows Vista, Microsoft contacted them and offered freebies. 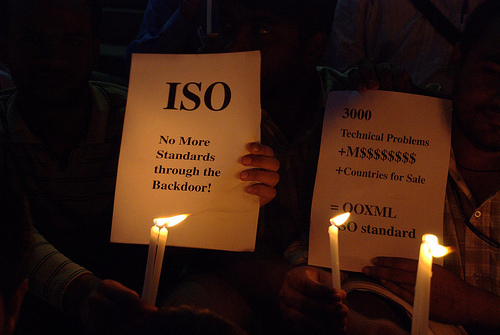 ITWire had its arm twisted by Microsoft for criticising OOXML and it wasn't alone. These are just a few cases where the journalists end up snitching, so it’s a fact. Here we have only a few incidents among many more that actually get reported. The Inquirer once wrote about how Microsoft-hired agencies bombard them with press releases, urging promotion of Microsoft. The 'promotion machinery' rarely pauses to breathe. It’s not single company. Microsoft assigns ‘sub-companies’, using contracts for advertising [1, 2]. It’s doing this for Windows Vista at the moment. Remember the excuses about the bribery of Swedish partners for OOXML? Same thing. The ACTA keeps marching in. but Heise reports that the media lobby’s Internet monitoring proposal has been rejected, at least for now. The Telecommunications Package will not prescribe uninterrupted monitoring of the internet as demanded by the Conservatives on behalf of the media and entertainment industry. On Monday evening, the Industry, Research and Energy Committee (ITRE) and the Internal Market and Consumer Protection Committee (IMCO) of the European Parliament voted on around 1,000 changes to the EU Telecom rules, consolidated into over 30 amendments. The compromise proposal put forward by the rapporteur for the draft framework directive, Catherine Trautmann, was accepted. The Conservatives are said to have become more sceptical about “internet monitoring”. On the other hand, according to Glyn Moody’s conversation with a high-level figure, nothing is over. We’ve recently seen that amendments typically sneak in at the 90th minute. Of course, that still leaves ground for concern – not about the intentions of Dr Kamall, but about the way in which the proposed amendments might be co-opted by the media industry against ISPs and their customers. It is clearly vital that the proposed changes be drafted as tightly as possible to avoid any function drift. Charles is concerned enough about the role of Sarkozy that he wrote a letter to his president. This, is simply not acceptable of a country like France. People should not be forced to live their cultural lives based on how a secretive but powerful lobby would like them to, and oppressive measures should not be enforced against a whole population just because those “happy few” refused to accept that the world has changed since the 1960’s. Culture does not work that way, but one particular industry does, and if it does not change it will die. A last word, Mr President. I love my country too much to think that the French culture, that is supposedly “in danger,” is a subculture of made up pop singers and evanescent starlets. Not everyone that speaks, writes and sings in French is worth to promote because a record label, or a publisher has acquired its rights and claims it’s the best thing since sliced bread. Perhaps you will remember that no one wanted to read François Villon and so many others; yet they are now considered to be national treasures. Forced consent is not an art. Delusion is not culture. I therefore ask you, Mr President, to stop this unfair, lobby-inspired legislative agenda on the “Three Strikes” approach and trust you will see truth and fairness in this request. With Intrepid Ibex, the next version of Ubuntu Linux, just a few months away the development team has released details of the most pressing issues for the 8.10 release. Among these are better 3G integration, tighter Firefox integration in KDE, and faster boot times. It’s taken the confluence of several disparate but connected events to create the perfect breeding ground for desktop versions of Linux to finally flourish. Introducing wattOS – A Lightweight Ubuntu! wattOS… the last frontier, the lightweight Ubuntu-based operating system is now here! Faster than anything else out there, wattOS is not just another Ubuntu clone, it is powered by the Openbox window manager, a standards compliant, fast, lightweight and extensible window manager. n May we shared that Multi-Pointer X (or MPX for short) was entering the mainline X server. While it was merged to master that month, X Server 1.5 was already branched out and therefore it won’t appear in X.Org 7.4, but it will appear in X Server 1.6 (X.Org 7.5) until next year. NYSE Euronext and its family of exchanges which include the NYSE, Euronext, Liffe, Alternext and NYSE Arca Options, operating in the US and Europe, now run on Red Hat Linux and look to Red Hat for support and services. Put it another way, over 4000 public companies and over $141 billion in daily stock transactions depend on Linux. The Chicago Mercantile exchange at last count traded 1.403 Billion contracts valued at $827 trillion annually. Available Now: Damn Small Linux 4.4.3 – Contains a few system modifications! The Sydney Diocese of the Anglican Church has decided to cut the Microsoft umbilical cord by moving to open source, starting with Office which will be replaced in the next three years. Which Is Faster – an Android or a LiMo? Google has made a habit of throwing its considerable weight behind a project and making it succeed. The company’s Android project, its effort at creating a Linux-based smartphone, is running into delays, while a similar effort by the LiMo Foundation already has produced handsets. The YDL PowerStation targets a wide range of consumer and business needs. For instance, it can replace the now aging Apple PowerMac G5 product family. Terra Soft says all Linux code optimized for the former G4 and G5 systems will readily migrate to the PowerStation. Ampro Computers announced two EPIC-format single-board computers (SBC) that ship with the company’s Ubuntu-flavored Linux distro. The Intel Core Duo-based ReadyBoard 830 will ship in August, while the ruggedized ReadyBoard 820 is shipping now, says Ampro. Major Web hosting provider launches low-cost groupware in U.S.